As I’ve gotten older I’ve had to both work harder and be smarter when it comes to keeping my testosterone levels from declining. I’m certainly not along in this struggle, though, as testosterone levels in American men have been declining steadily over the past two decades. While there are a number of factors behind the decline, the shift to diets that typically consist of heavily-processed foods and foods high in sugar and low in fat has played a major role in both decreased testosterone levels in males as well as the epidemic rise in obesity across the country (and beyond). 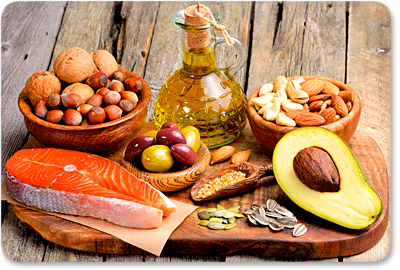 Research now reveals that any diet consisting of less than 40% fat can lead to significant decreases in testosterone levels and increases in bad estrogen in both men and women. The easiest way to make sure this doesn’t happen to you is to simply add more friendly fats and foods that are rich in vitamins that have been shown to promote healthy hormone production. One important thing to keep in mind is that you want to stick to small serving sizes when adding these fatty foods to your diet because they yield over twice the calories of other healthy proteins and carbs you eat — 9 calories per gram of fat vs. 4 calories per gram for proteins and carbs. Also, keep in mind that testosterone levels decrease when you consume sugar, as sugar elevates your insulin levels, another factor leading to low testosterone. So make this a habit… buck the trend of excessive sugar consumption — about 12 teaspoons a day for the Average American! — while also dramatically reducing or eliminating processed foods to help prevent your testosterone levels from rapidly declining. Want to naturally kick your testosterone levels into an even higher gear? Getting your diet up to speed is just the first step in naturally boosting your testosterone levels. Both intermittent fasting and short, intense exercise have been shown to considerably boost testosterone as well, so combining your fat-friendly diet with a combination of higher intensity exercise and/or intermittent fasting can really boost your testosterone production in a completely natural, healthy way. Short and intense exercise has a proven positive effect on increasing testosterone levels as well as preventing its decline, especially as you get older and move into your late 30s and beyond. This is in contrast to aerobics or prolonged moderate exercise, which have shown to have negative or no effect on testosterone levels. And since most people these days complain about not having enough time to exercise, these shorter workout sessions at a higher intensity are likely to fit better into your schedule so that you can make them a consistent habit. In fact, I’ve created a short, intense 12-minute workout plan specifically designed for the hormonal condition of people over 35 years old, especially those who struggle with declining testosterone levels or finding time to exercise regularly. This 12-minute metabolic trick will help your body kick your hormones into overdrive and burn more belly fat in 12 minutes than you could in an hour of traditional cardio exercise. We’re GIVING It Away 100% FREE!